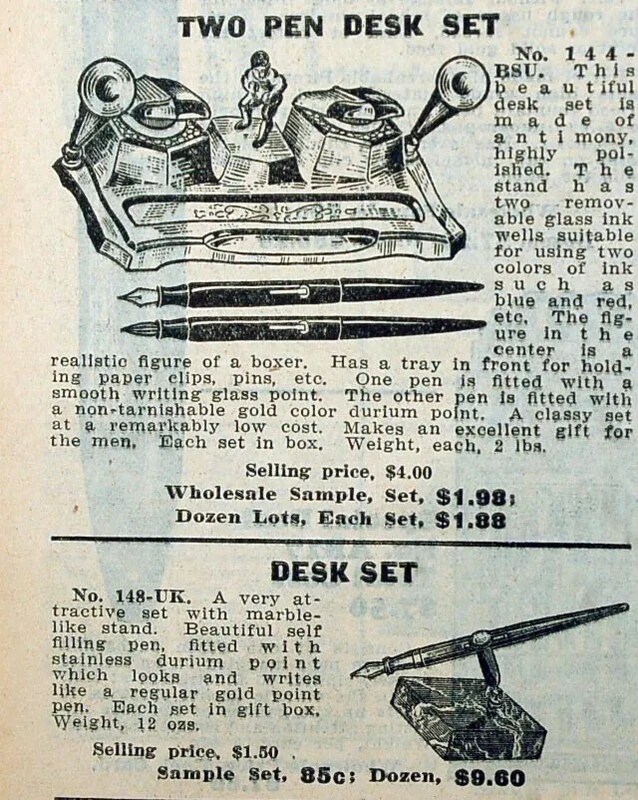 I know that this is a very specific topic with no actual pens to show, but a pen friend of mine asked if I had any pre 1940s Spors Catalogs that might have Desk Sets in them. 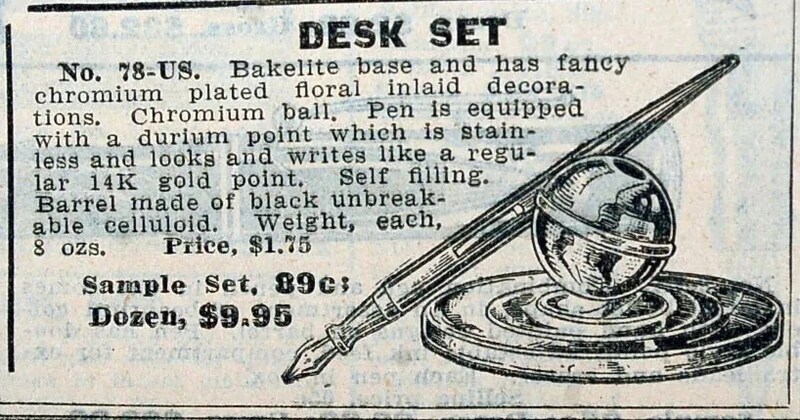 As I was photographing my 1935 catalog and its Desk Set references for him, I remembered how many comments and questions I get on various Spors pens. This Boxer Set is very interesting to me and I must admit that I have never seen one. One of the pens is, of course, one of the trademark glass-nibbed Spors imports. These are all of the sets in the 1935 catalog. I will do a search of an earlier 1933 catalog as I locate it. One of my favorite posts was one I wrote on September 17, 2008 titled (and linked here) Spors Fountain Pen Entertainment Center. 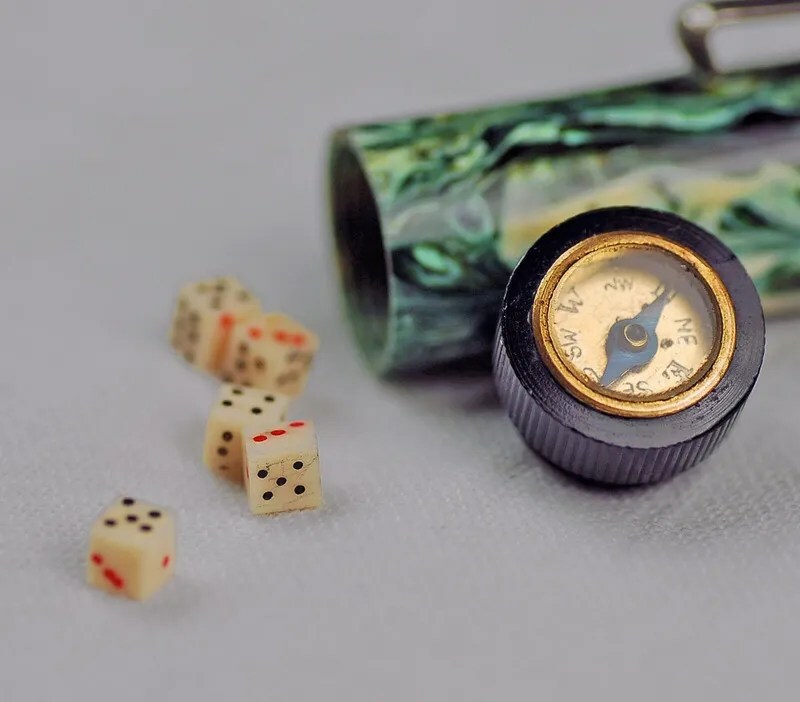 Not because the pen is a fantastic and valuable pen, but just that it was fun to share what a surprise it was when I opened the pen up to clean the compass and the dice fell out. At the time, I ran the pictures by some other collectors and no one seemed to recall any such pens. 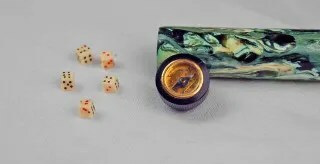 Below is a picture that appears in that post, showing the compass removed from the cap-end, with the enclosed dice falling out. I recently purchased an old SPORS mail order catalog from 1933, in hopes that it would have some information on this pen. Below is a photo of the cover of this mail order catalog, produced by the Spors Company, of Le Center, MN. When I got to page 23 I was rewarded with a lineup of these Japanese imports, which includes this pen. You can also see a standard crescent filler, similar to the one restored in my post of February 13, 2008, Made in Japan. 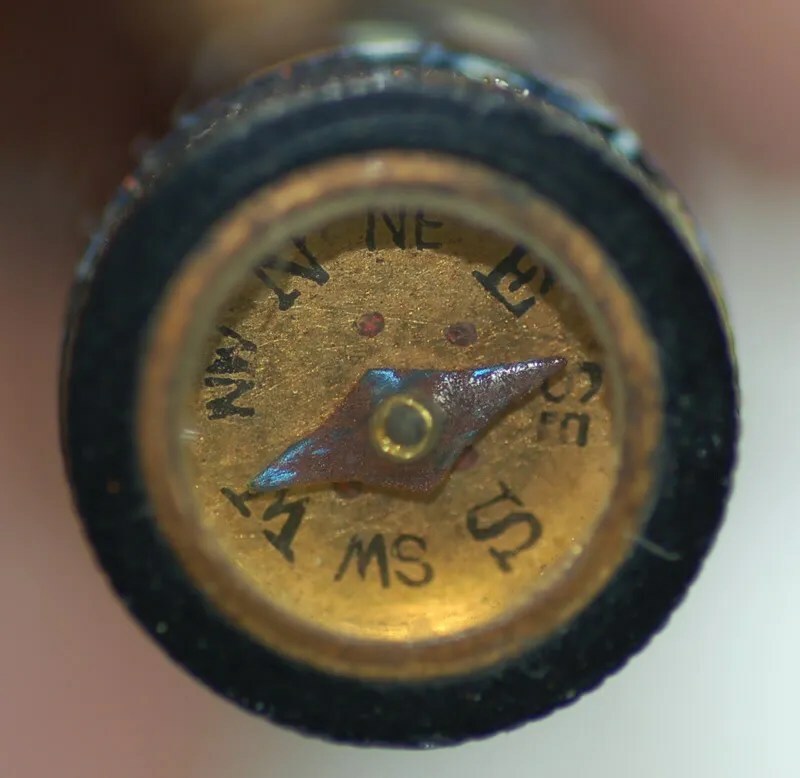 Here is a close up of the advertisement showing the dice stored under the compass. And here is the specific wording promoting this version. 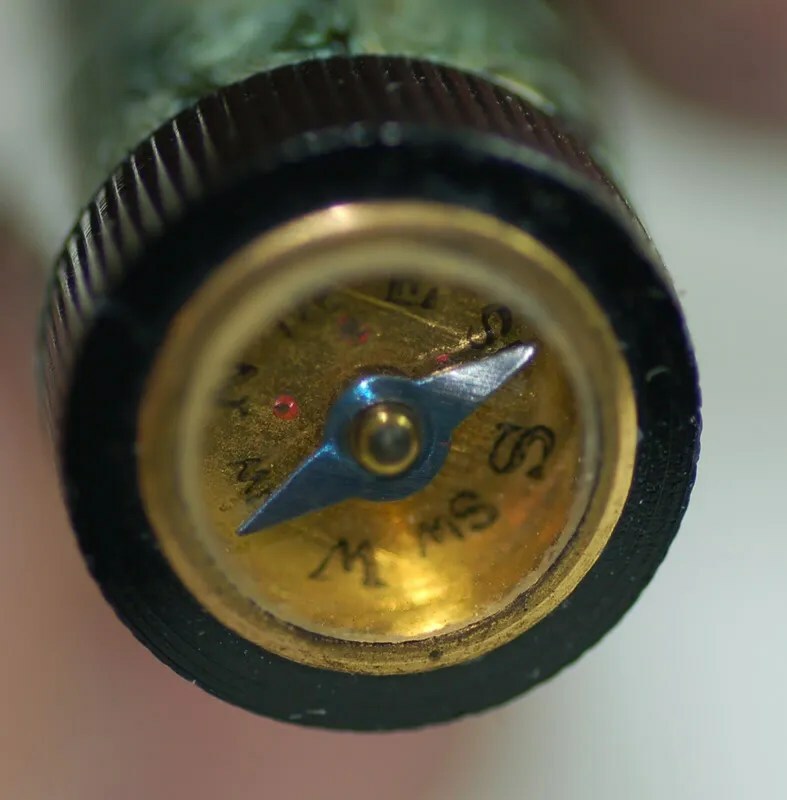 Interestingly, the compass is the selling point, with emphasis placed on it being removable and worn separately. I am not sure why you would be attracted to this and it is quite amusing. Still no mention of the dice other than in passing. 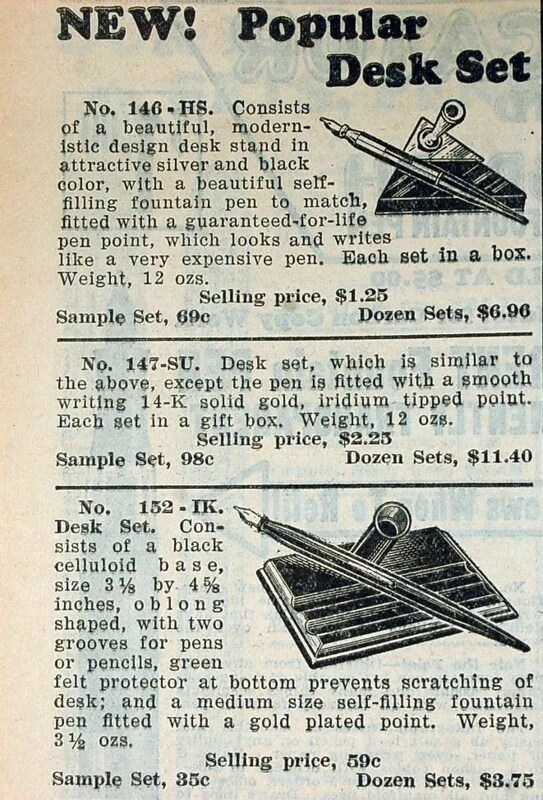 At least I was able to find them in this catalog which narrows the age of this pen to near 1933. Addendum: Spors catalogs are quite entertaining to the pen collector. In a separate location of the catalog you can see where they used pens to promote other products. (Or was it the other way around?). This $.49 deal was quite a package ~ Perfume, Face Powder, Crystal Necklace, and Pen/Pencil set. The catalog contains many more of these mix and match deals aimed at retailers, as well as the general public. Mr. Spors was a master at mail-order and sales. 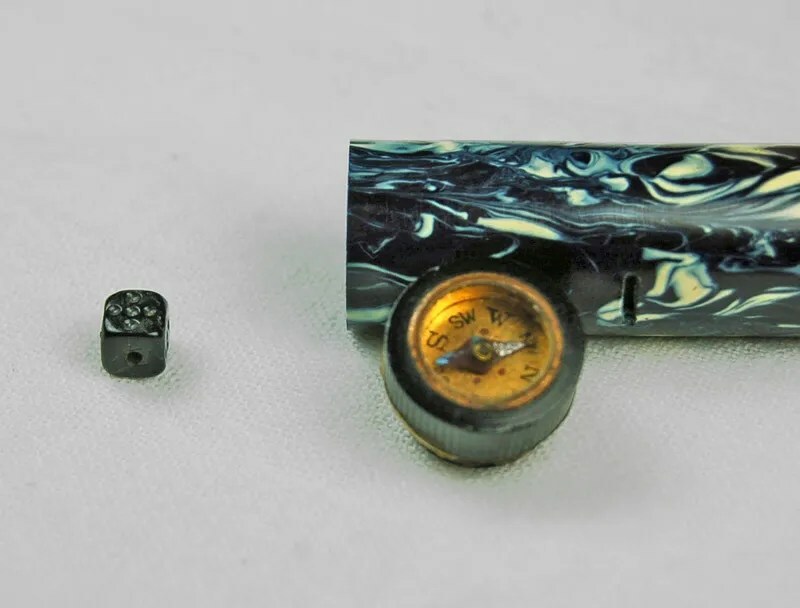 Part of Fountain Pen Restoration is the placing of the fountain pen in history. 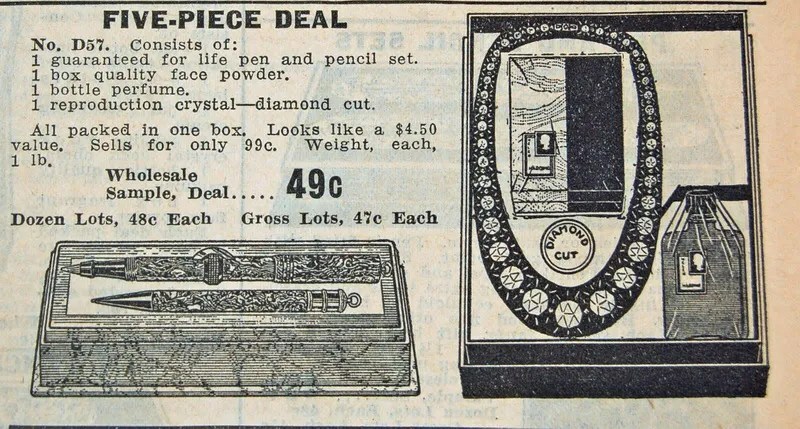 The discovery of this catalog finally allowed me to place this curio pen near 1933. 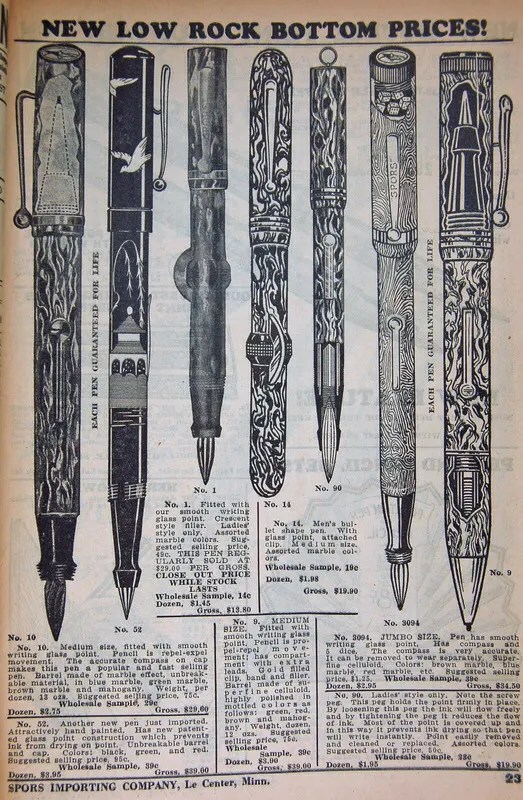 I have posted several articles about Spors Fountain Pens and their advertising. I have found their pens interesting, challenging to restore, and local, as they were marketed out of LeCenter, MN. I have recently received some correspondence from the grandson of Frank (Franz) Spors, Mr. Dennis Spors. He is still operates a consulting business in Michigan and uses the same Company Name as his grandfather. He shared some interesting information on the Spors Company. 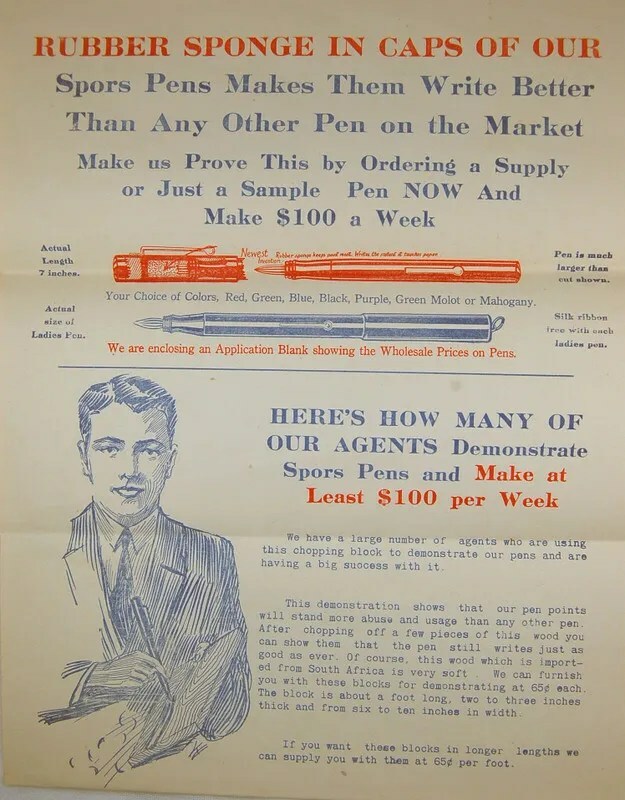 In the articles above, I have mentioned that some of these Spors Pens were made in Japan and WWII obviously stopped the shipment of these pens to Minnesota distribution. Mr. Spors shares this additional interesting information on his grandfather and the challenges of the World War. Once again, thank you to Dennis Spors for sharing this information with me on the Spors Company and its founder, Frank (Franz) Spors. 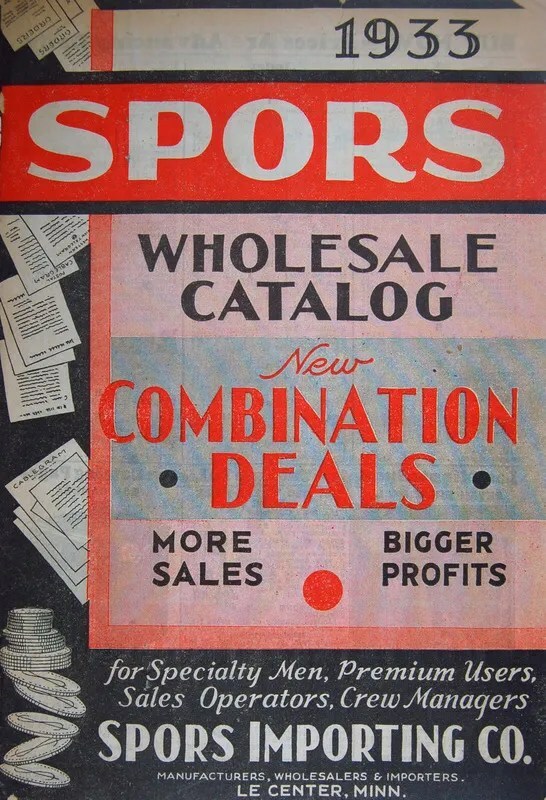 I have acquired a 1933 Spors catalog and will be sharing some pen advertisements from it in the future as I get a chance to scan them. Frank Spors sold goods through a catalog from Le Sueur, Minnesota. 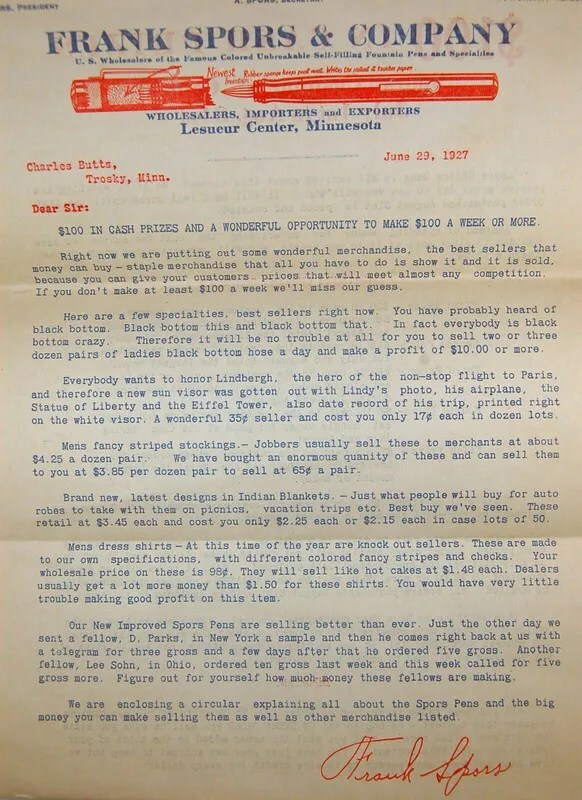 The following correspondence with a Charles Butts of Trosky, MN reveals one of the ways that Spors Marketed their pens. I won’t go into the pens themselves as the above two referred posts will do that, but it is interesting to see how his marketing program worked. What first strikes me is the demonstration that the salesman can do (after purchasing a piece of “soft” wood for $0.65) to prove how strong the nib is. Images of a door to door salesman cutting pieces of wood with his glass nibbed pens provide me with quite a chuckle. And this should, of course, lead to at least $100 per week. One other quick question from the page below – why does the rubber sponge in the cap make the pen write better than any other pen on the market? Following is the application to be filled out and the cost involved in getting started on the path to riches. Based on this, I figure you only had to sell about 120 pens per week to make the $100.00! Of course, if pens weren’t big sellers in your area, or if the wood cutting trick wasn’t particularly effective, or you couldn’t get your hands on the cool pens with the dice under the compass (see my post of September 17, 2008), then you could resort to many items covered in the letter to Mr. Butts below. After all, everyone is black bottom hose crazy….and who can resist a Lindbergh visor or shirts that sell like hotcakes. 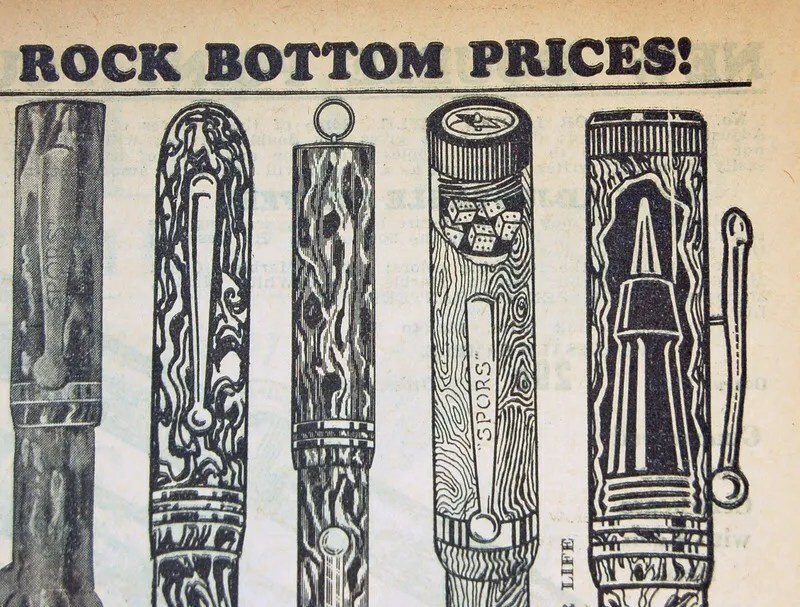 Back to pens – Apparently some found them an easy sale and they actually do still show up quite frequently in auctions and at antique stores. Just look at the next to last paragraph below. 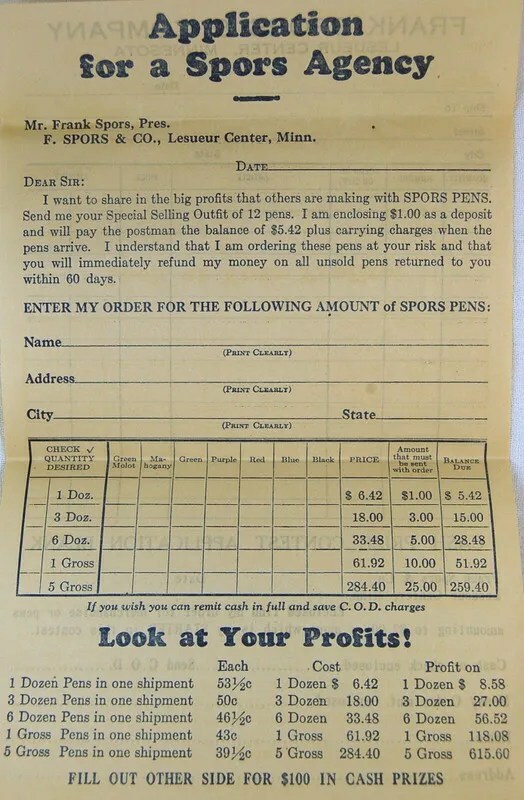 If you run across a Spors pen today, it may have been sold by the successful Mr. D. Parks of New York or Lee Sohn in Ohio. I wonder if Mr. Spors used one of these pens to sign the letter? Finally, here is an advertisement that I picked up, separately from the letter to Mr. Butts, to be used in a Store environment. The recipient of the coupon can purchase the pen for 69 cents. Not bad for a pen that can carve wood…..
Spors Pens, with the glass nibs, were imported from Japan up until WWII, when the supply ran out for obvious reasons. They are interesting, and thier marketing was as well. Frank Spors, of Spors and Company of Le Center, MN (formerly called Le Sueur Center) was the owner of Spors and Company, a marketing company that sold many items through mail order, to drug stores, to salesmen, and to the public. One such successful item was a crescent-fill, glass nibbed fountain pen. This pen was made in Japan and shipped to Spors for distribution from the Post Office in Le Center. An advertisement from a 1926 catalog can be seen below. Several of these pens can be found today. They came in many colors and finishes through the years until the Japanese supply connection stopped as World War II approached. One of the main problems encountered in restoring a Spors Pen is referred to in the diagram below. It shows that the section is glued into the barrel so that the user will not “be so apt to take it apart, twist the ink container (sac) all out of shape and then finally blame the pen.” I have seen these in solid colors and also colorful celluloid. The sections can be very difficult to remove from the barrel, due to the referred glue. The pen I am restoring is a brown marble Spors. I have seen this particular model in many colors – green, blue, and red come to mind. I started out very carefully to remove the section from the barrel. Patience was the key. I applied gentle heat from a heat gun in small doses. After each time of rotating the barrel about 10 inches above the gun, I gently rocked the section using my rubber ended section pliers. The first several times produced nothing, but after a few rest breaks, I finally heard a small click and noticed that the section had moved a bit. A few more doses of heat and more gentle rocking and the glued section was out. Here is a picture of the pen broken down. As you can see, the nib is glass as opposed to gold or steel. It is a pressure fit into the section. The sac was hardened in one piece which made removal very easy. You can see the crescent fill bar in the center of the picture. Here is a close up of the imprint. After scraping the section clean and removing the remnants of the old sac, I polished up the crescent bar and clip and cleaned the outside of the barrel and cap, being careful not to touch the original price sticker. The sticker reads: Guaranteed – F. Spors and Co. – Lesueur Center, Minn. – Price $1.25. I placed a size 14 sac on the section and inserted the crescent into the barrel using a pair of needle nose pliers. After slipping it through the slot, I locked it, allowing the sac and section to be inserted into the barrel. Testing with water shows that the pen works and is ready to use. Here is a picture of the completed Japanese Made – Minnesota Marketed – Glass Nibbed – Crescent Filler. Thank you Frank Spors, for this fountain pen curiosity.